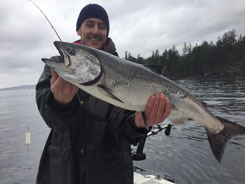 We have a great start to our winter salmon season with consistent catches through late October and November. This is one of our favorite times of the year to fish. There is very little pressure in our favorite fishing spots and the action tends to be good. 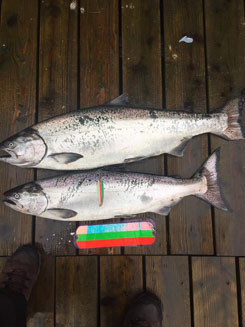 The salmon are moving around a lot during the winter season so knowledge of where the fish tend to move on certain tides and where the bait schools of Herring and Anchovy are is key to success. The amount of bait that we are seeing this winter has been impressive. We fished English Bay on this past weekend and I do not think I have seen that much bait across the bay in years. This bait abundance will bring the salmon into the bays and reefs and hold them there as feed and grow. We have been concentrating our efforts on Howe Sound and around Bowen Island. English Bay has also been a target area. I’d recommend fishing close to the bottom as this is where the salmon tend to lie in the winter season. We are using nothing but glow flashers and spoons as they are more visible in the deep water. Some of our favorite spoons this time of the year are Irish Cream, Night Rider, Skinny Gees and Glow Green. We are using nothing but 3 1/2 inch spoons as the bait is small this time of the year. Most of the salmon that we are cleaning lately have had Anchovy in there stomachs. The crabbing has been slow as is usual for late fall but we have found a few areas that have been producing for us. During cooler months, our company has a steamer on our dock at Granville Island so you can have a crab cook when you come in off your charter. The commercial crab season is closed on December 1st so after that date the crabbing starts to pick up a lot. The prawning has been very good and on a longer 7 or 8 hour charter, we can set prawn traps with your group. The remains fairly mild (with some sunny and raiy days) so it is beautiful to be out enjoying the West Coast scenery! 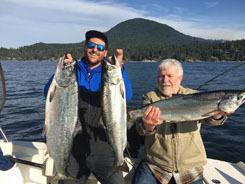 As we move into the end of March and exit the winter season, we find ourselves entering the early spring Chinook salmon fishery with some very good results. 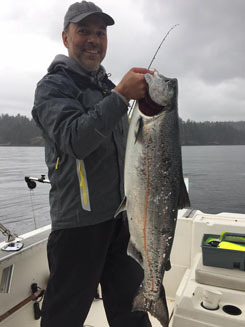 Our company specializes in the winter fishery and we have continued getting out on a regular bases even though the weather has been a bit challenging at times – we do love this season! Currently, the weather pattern in Vancouver looks like it is going to warm up with some sunshine in the forecast. The herring spawn has been in full swing for over a month and this has brought the feeder Chinook into the bays and reefs along the Pacific south coast. 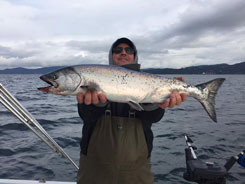 These salmon are aggressive in their feeding patterns and are great fighters when hooked. We have been lucky enough to have some charters lately that have hooked up over twenty times. Double and even a few triple headers have been on menu. Many of our charters have seen between 4 and 12 hook ups per trip. Our keeper size fish have been between 8 and 12 pounds. Some of our guests have landed fish in the mid-teens and we have had a few in the twenty-pound range. Our guides have been running a few combinations of gear. Spoons have been our favorite like Army Truck, Green/Glow, Night Rider and some new glow spoons (from various companies) working well. Our flashers are also of the glow variety but do not be afraid to run the original green/silver flashers as the herring bait schools are silver as well. We have also been successful with some hootchies like glow-green spackle back, straight glow and chartreuse-spackle back. Depths have varied depending on where we are fishing. In English Bay, we are fishing the entrance to the bay and off the mile markers and the Bell Buoy. In these areas, we are running gear from 80 feet right down to !50 feet -- staying close to the bottom. Fishing up Howe Sound, we are near the bottom targeting depths of 100 feet to 200 feet. If you are fishing ‘Hole in the Wall’ or Defence Island, you may be in water depths of 300 or 400 feet so In these cases try fishing at 80 to 140 feet. 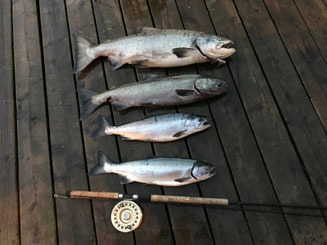 Lately, the salmon are starting to move a lot more so we are running gear up higher on some days. Soon we will see the first push of Spring spawning salmon. Stay tuned for an update on this front. Prawning and crabbing have both been good as this time of year brings the most bountiful Dungeness crab harvest well through Spring. 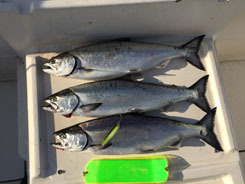 We are approaching the end of January and the salmon fishing has been steady. The bait balls of herring have been on the move lately so we have been fishing a number of our favorite winter haunts in order to find the fish. Locate the bait and there is a very good chance that you will find the salmon. Coupled with this the tides will push the salmon to certain areas, especially on the reefs, so you have to couple the two together. 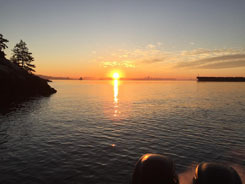 Our boats have been fishing near the bottom in depth of 80 to 140 feet in English Bay and 100 to 200 feet at Bowen Island and up Howe Sound. Spoons are still our favorite choice, as they always are in the winter. 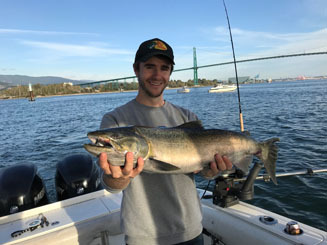 Hootchies are starting come on outside English Bay and bait is starting to produce although we do not run it a lot of bait till later in the spring. Our company has been using some new spoons this winter, although we tend to use our old favorites we have been running spoons from two new companies. Stop in to our tackle shop on Granville Island and we can show you some of our favorites. Areas such as English Bay; the Capilano side has been better then the freighters lately; Bowen Island and the last few weeks Howe Sound right up to Defense Island, have all been good on certain days. In the next few weeks we will see the Herring spawn start and this will see things change. We are already starting to see bait balls in column formation up near the surface. This is the start to this epic migration of millions of herring massing together to spawn. This tends to bring the bigger fish into the bays. There has already been salmon in the high teens and a few in the mid to high 20 pound range caught in the last week. Stay tuned for an up date on the herring spawn! Our winter special is now on so enjoy some great salmon fishing at a great price. This is one of our favorite times of the to fish with little pressure on the fishery. We set crab traps with all our charters and can set prawn traps with our eight-hour trips. Both crabbing and prawning have been good!